الدورة الستينية sexagenary cycle، وتُعرف أيضاً بإسم الجذوع والفروع أو گان‌ژي ganzhi هي دورة من ستين مدة، تُستخدم لمعرفة الزمن في الصين وباقي East Asian cultural sphere. It appears as a means of recording days in the first Chinese written texts, the Shang oracle bones of the late second millennium BC. Its use to record years began around the middle of the 3rd century BC. The cycle and its variations have been an important part of the traditional calendrical systems in Chinese-influenced Asian states and territories, particularly those of Japan, Korea, and Vietnam, with the old Chinese system still in use in Taiwan. This traditional method of numbering days and years no longer has any significant role in modern Chinese time-keeping or the official calendar. 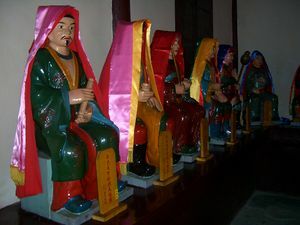 However, the sexagenary cycle is used in the names of many historical events, such as the Chinese Xinhai Revolution, the Japanese Boshin War, and the Korean Imjin War. 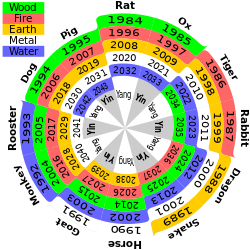 It also continues to have a role in contemporary Chinese astrology and fortune telling. تماثيل آلهة تاي سوي المسئولة عن السنوات المفردة في الدورة الستينية. Each term in the sexagenary cycle consists of two Chinese characters, the first being one of the ten Heavenly Stems of the Shang-era week and the second being one of the twelve Earthly Branches representing the years of Jupiter's duodecennial orbital cycle. The first term jiǎzǐ (甲子) combines the first heavenly stem with the first earthly branch. The second term yǐchǒu (乙丑) combines the second stem with the second branch. This pattern continues until both cycles conclude simultaneously with guǐhài (癸亥), after which it begins again at jiǎzǐ. This termination at ten and twelve's least common multiple leaves half of the combinations—such as jiǎchǒu (甲丑)—unused; this is traditionally explained by reference to pairing the stems and branches according to their yin and yang properties. This combination of two sub-cycles to generate a larger cycle and its use to record time have parallels in other calendrical systems, notably the Akan calendar. 1 子 zǐ ji2 shi ne ja 자 tý Rat (chuột;𤝞) Rat (鼠) 11 p.m. to 1 a.m.
2 丑 chǒu chau2 chū ushi chuk 축 sửu Water buffalo (trâu;𤛠) Ox (牛) 1 to 3 a.m.
3 寅 yín yan4 in tora in 인 dần Tiger (hổ/cọp;虎/𧲫) Tiger (虎) 3 to 5 a.m.
4 卯 mǎo maau5 bō u myo 묘 mão/mẹo Cat (mèo;猫) Rabbit (兔) 5 to 7 a.m.
5 辰 chén san4 shin tatsu jin 진 thìn Dragon (rồng;龍) Dragon (龍) 7 to 9 a.m.
6 巳 sì ji6 shi mi sa 사 tỵ Snake (rắn;𧋻) Snake (蛇) 9 to 11 a.m.
7 午 wǔ ng5 go uma o 오 ngọ Horse (ngựa;馭) Horse (馬) 11 a.m. to 1 p.m.
8 未 wèi mei6 mi or bi hitsuji mi 미 mùi Goat (dê;羝) Goat (羊) 1 to 3 p.m.
9 申 shēn san1 shin saru shin 신 thân Monkey (khỉ;𤠳) Monkey (猴) 3 to 5 p.m.
10 酉 yǒu jau5 yū tori yu 유 dậu Rooster (gà;𪂮) Rooster (雞) 5 to 7 p.m.
11 戌 xū sut1 jutsu inu sul 술 tuất Dog (chó;㹥) Dog (狗) 7 to 9 p.m.
12 亥 hài hoi6 gai i hae 해 hợi Pig (lợn/heo;𤞼/㺧) Pig (豬) 9 to 11 p.m.
*The names of several animals can be translated into English in several different ways. The Vietnamese Earthly Branches use cat instead of Rabbit. Show one of the Sexagenary Cycle tables (the following section), look for 44 in the first column (No) and obtain Fire Goat (丁未; dīng-wèi). Show one of the Sexagenary Cycle table (the following section), look for 52 in the first column (No) and obtain Wood Rabbit (乙卯; yǐ-mǎo). 246 = 60 × 4 + 6. Remainder is therefore 6 and the BC column of table "Sexagenary years" (just above) gives 'Wood Rabbit'. When doing these conversions, year 246 BC cannot be treated as -246 AD due to the lack of a year 0 in the Gregorian AD/BC system. For astrological purposes stems are also necessary, and the months are named using the sexagenary cycle following a five-year cycle starting in a jiǎ (甲; 1st) or jǐ (بالصينية: 己; 6th) year. The first month of the jiǎ or jǐ year is a bǐng-yín (丙寅; 3rd) month, the next one is a dīng-mǎo (丁卯; 4th) month, etc., and the last month of the year is a dīng-chǒu (丁丑, 14th) month. The next year will start with a wù-yín (戊寅; 15th) month, etc. following the cycle. The 5th year will end with a yǐ-chǒu (乙丑; 2nd) month. The following month, the start of a jǐ or jiǎ year, will hence again be a bǐng-yín (3rd) month again. The beginning and end of the (solar) months in the table below are the approximate dates of current solar terms; they vary slightly from year to year depending on the leap days of the Gregorian calendar. The table above allows one to find the stem & branch for any given date. For both the stem and the branch, find the N for the row for the century, year, month, and day, then add them together. If the sum for the stems' N is above 10, subtract 10 until the result is between 1 and 10. If the sum for the branches' N is above 12, subtract 12 until the result is between 1 and 12. For any date before October 15, 1582, use the Julian century column to find the row for that century's N. For dates after October 15, 1582, use the Gregorian century column to find the century's N. When looking at dates in January and February of leap years, use the bold & italic Feb and Jan.
Step-by-step example to determine the stem-branch for October 1, 1949. (day stem N + month stem N + year stem N + century stem N) = number of stem. If over 10, subtract 10 until within 1 - 10. 49 isn't on the table, so we'll have to mod 49 by 40. This gives us year 9, which we can follow to find the N for that row. Century 19: N = 2. (1 + 1 + 7 + 2) = 11. This is more than 10, so we'll subtract 10 to bring it between 1 and 10. Stem = 1, بالصينية: 甲. (day branch N + month branch N + year branch N + century branch N)= number of branch. If over 12, subtract 12 until within 1 - 12. Again, 49 is not in the table for year. Modding 49 by 16 gives us 1, which we can look up to find the N of that row. (1 + 5 + 5 + 2) = 13. Since 13 is more than 12, we'll subtract 12 to bring it between 1 and 12. Branch = 1, بالصينية: 子.
Stem-branch = 1, 1 (بالصينية: 甲子, 1 in sexagenary cycle = 32 - 5 + 33 + 1 - 60). Day 31: N = 1; month of December: N = 2; year 92 (92 mod 40 = 12): N = 3; century 15: N = 5. (1 + 2 + 3 + 5) = 11; 11 - 10 = 1. Day 31: N = 7; month of December: N = 6; year 92 (92 mod 16 = 12): N = 3; century 15: N = 5. (7 + 6 + 3 + 5) = 21; 21 - 12 = 9. Day 4: N = 4; month of August: N = 0; year 38: N = 9; century 13 (13 mod 2 = 1): N = 5. (4 + 0 + 9 + 5) = 18; 18 - 10 = 8. Day 4: N = 4; month of August: N = 4; year 38 (38 mod 16 = 6): N = 7; century 13 (13 mod 4 = 1): N = 9. Stem-branch for May 25, 105 BC (-104). Day 25: N = 5; month of May: N = 8; year -4 (-4 mod 40 = 36): N = 9; century -1 (-1 mod 2 = 1): N = 5. (5 + 8 + 9 + 5) = 27; 27 - 10 = 17; 17 - 10 = 7. Day 25: N = 1; month of May: N = 8; year -4 (-4 mod 16 = 12): N = 3; century -1 (-1 mod 4 = 3): N = 3. (1 + 8 + 3 + 3) = 15; 15 - 12 = 3. Alternately, instead of doing both century and year, one can exclude the century and simply use -104 as the year for both the stem and the branch to get the same result. '"`UNIQ--postMath-00000004-QINU`"' for Gregorian calendar and '"`UNIQ--postMath-00000005-QINU`"' for Julian calendar. '"`UNIQ--postMath-00000007-QINU`"' for Jan or Feb in a common year and '"`UNIQ--postMath-00000008-QINU`"' in a leap year. Stem-branch for February 22, 720 BC (-719). Stem-branch for November 1, 211 BC (-210). Stem-branch for February 18, 1912. Stem-branch for October 1, 1949. Japanese invasions of Korea (1592–98) – Korean name of the event, "Imjin War", named after the "Yang Water Dragon/Imjin" year 1592. ^ Nussbaum, Louis-Frédéric. (2005). "Jikkan-jūnishi" in Japan Encyclopedia, p. 420. ^ Smith (2011), pp. 1, 28. ^ For the Akan calendar, see Bartle (1978). Bartle, P. F. W. (1978). "Forty days: the Akan calendar". Africa: Journal of the International African Institute. 48 (1): 80–84. doi:10.2307/1158712. Kalinowski, Marc (2007). "Time, space and orientation: figurative representations of the sexagenary cycle in ancient and medieval China". In Francesca Bray. Graphics and text in the production of technical knowledge in China : the warp and the weft. Leiden: Brill. pp. 137–168. ISBN 978-90-04-16063-7. Smith, Adam (2011). "The Chinese sexagenary cycle and the ritual origins of the calendar". In John Steele. Calendars and years II : astronomy and time in the ancient and medieval world. Oxford: Oxbow. pp. 1–37. ISBN 978-1-84217-987-1.